They say there is no substitute for experience, and I have twenty five years’ with a top-five blue chip company. I understand business and technology, and how to make sure the latter supports the former. If you are a start-up businesses I can design your IT setup from the ground up, whether it be a single PC with a broadband connection or multiple networked PCs geared to rapid expansion. I also design and implement computerised business processes using Spreadsheets, Word processors and Database tools. 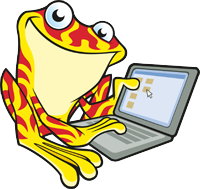 If technology is the question, Hot Frog is the answer! my clients know where data is held and how to get to it. If you are already established and finding that your computer systems have expanded in a less than strategic way, I offer a status review that will include everything from documenting the existing set-up to networking machines, sharing resources, business continuity, backups and building best practice procedures and policies. full backups are taken of old equipment, and that these backups are accessible. any changes between old and new machines are documented and explained so that the new machine is immediately useable without having to hunt down programs and data. I also conduct security reviews, which cover everything from access, location, operating systems, anti-virus and malware to remote access, storage and data protection. I offer ongoing support and a call-out service and holiday cover for on-site support staff on a tailored basis to ensure continuity of service for your business.